Toshiba, well-know in the consumer electronic, managed print services, and POS arenas, and somewhat active in recent years in the pro AV space with large LED walls and LCD panels, has been busy of late re-energizing their digital signage offerings. But Toshiba is taking a different tack with their latest efforts– steering away from just selling AV/digital signage hardware to end users or AV dealers/integrators and instead focusing on offering turnkey digital signage solutions and digital signage managed services. Toshiba America Business Solutions announced just days after the wrap of the LEAD conference that its vice president of marketing, services and solutions, Bill Melo, has been appointed chief marketing executive. Melo is show here, last week at the Toshiba LEAD conference, demonstrating the Toshiba interactive digital signage platforms. In addition to his current responsibility of managing product marketing, strategic software and platform development, marketing communications and marketing operations, Melo will now take on a broader marketing role. The space features Toshiba technology including a 6-by-13 foot LED video wall, an 8-by-5 foot Toshiba Ultra HD video wall, two 46-inch Toshiba Virtuoso interactive touch displays featuring team and event-specific information, a 60-inch Toshiba “Touch & Get” interactive kiosk allowing for high-speed transfers (to fans’ smartphones) of exclusive Los Angeles Kings and STAPLES Center content, and three 65-inch Toshiba Ultra HD displays. Note that the LED wall at the new STAPLES Center is a product from D3. Toshiba has partnered with D3– an independent and well known provider of large scale LED walls for many Times Square and other large-venue and outdoor LED applications. Toshiba had been offering their own LED walls over the past few years, but they’ve gotten out of that and are now using partners to provide these to customers. And Toshiba is following a similar model for LCD panels. Like all the big Japanese manufacturers Toshiba offered their own LCD flat panels for years– but like most manufacturers they discovered the harsh lessons of commoditization and got out of manufacturing LCD panels themselves. Currently, Toshiba is leaving open the possibility of using their own LCD panels again but they are more focused now on the other pieces of the digital signage puzzle, and work with partners to provide LCD panels for solutions they are selling in the market. All this culminated in a successful, well-attended user conference last week in Dallas– Toshiba’s LEAD 2014 Conference from Nov. 10-12 at the Gaylord Texan. Toshiba's LEAD conference brought together a good mix of (and good number of– over 600) digital signage and managed print service end users, dealers, and even content providers– so it was not your typical industry event. In fact, Toshiba told attendees at the conference that it was quite open about the fact that is pursuing a dual-track marketing strategy: selling digital signage solutions directly to some customers (remember Toshiba has a huge base of customers for managed print and retail POS), and going through the pro AV channel– AV dealers and integrators– to grow the market to new customers and to service some existing ones. (Toshiba’s sales are about 50% direct, and 50% through dealers.) Toshiba’s approach is therefore different from the other large Japanese and Korean AV/digital signage hardware manufactures– who are hardware vendors primarily if not exclusively. What I found refreshing was Toshiba’s forthrightness about their model. And it’s no mystery why any large player in this space would want to be more focused on managed services and turn key digital signage offerings, given the scary nature of shrinking margins for displays. Toshiba said at the LEAD conference last week that they are particularly focusing on the Sports, Schools, and Retail and Grocery markets for growth– and are keen on enlisting the pro AV channel to co-market services there. Bill Melo demos Virtuoso interactive touch displays at STAPLES Center, with “Touch & Get” interactive feature allowing for high-speed transfers to fans’ smartphones of exclusive Los Angeles Kings and STAPLES Center content. Toshiba’s digital signage offerings are centered around two platforms: Virtuoso, and Experience Manager. Virtuoso was introduced last year, and is a touch-screen display and enclosure for wayfinding or any kind of interactive digital signage function, with Experience Manager as the cloud-based CMS. Both Experience Manager and Virtuosos are part of Toshiba's Ellumina Digital Signage services– Toshiba’s offering that allows a Toshiba team to work with the end user (or through an AV integrator) to manage ongoing content for indoor and outdoor digital displays, video walls, interactive touch panels and QSR menu boards. Behind the scenes– or maybe better said between the lines– of all of this is Tohisba’s strength and depth in the POS world. Point of Sale (used to be called “cash registers”) is the holy grail of digital signage– we’ve been hearing for years that one day digital signage in a retail store for example would be totally integrated with POS data. So that all the content in a store would run according to what some have called a “contextual content” regime. So far it has not really happened (because big retailers are super-protective of their POS data), but it’s still the holy grail. So remember that Toshiba is huge in POS, and with their new activity in digital signage, things could get interesting. In fact, Toshiba told me at the LEAD conference that they have a big POS deal coming – that will be announced in the coming weeks. It is fruition of Toshiba’s having bought what they now call their Toshiba Global Commerce Solutions, from IBM. Back on April 17, 2012, Toshiba acquired IBM Retail Store Solutions (IBM RSS). IBM RSS consisted of the retail point-of-sale solutions from IBM, including the SurePOS product line, AnyPlace Kiosk, Self Checkout and software. This new retail rollout, with about 1000 retail locations involved, will be big for Toshiba, with planned digital signage in the second phase of the rollout. 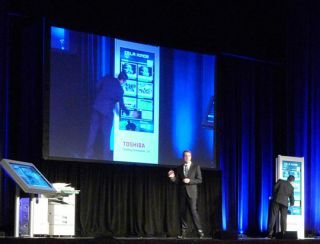 It will be interesting to see if Toshiba can integrate POS data and digital signage content. In any case, the company should be one to watch in 2015 in the perennially booming digital signage arena.